We’ve got quite a different feel to this offseason in Kansas City, than in most recent years. Instead of starting to study up on the prospects in Week 4 of the regular season and feel the pain of waiting for draft day to come, I actually didn’t care much about it until after the Wild Card week of the season! A funny thing happens though during this time of year, the prior season becomes a distant memory. We, as fans, also take a different approach to free-agency. While last year we were crazed on getting upgrades at a majority of positions, this time around, I simply wanted them to hold onto their core and build around them. Amidst the uproar about how those Donkeys in Denver have spent a boatload of money assembling this year’s best version of the offseason “Dream Team”, us KC fans have been foaming at the mouth, waiting for just that ONE splash. To make matters worse, we lost a core of starters & significant contributors that while not game-changers, create some glaring holes that still need to be filled. I’ll tell you that one cure for all our ills over this free agency period should be when Scott Pioli scrambles to scoop up some of our cast-offs. It’s like he’s afraid to move on and still dead set on proving us KC fans wrong. I don’t kow about you, but it makes me rest easier knowing he was first in line to grab players we discarded. Tyson Jackson, Geoff Schwartz, Jon Asamoah, Branden Albert, Dexter McCluster, Quintin Demps, Akeem Jordan…these are a few of the names that the Chiefs lost this offseason. They’ve attempted to fill some of those holes by bringing in role players like Joe Mays and Vance Walker, while resigning some of the existing depth (Frank Zombo, Husain Abdullah). Their best addition might be by subtraction as they bid adieu to last year’s acquisition of Dunta Robinson. He proved to be a huge mistake by signing him last year for 2 years and $13M. But this transaction of signing him, allowed us to see that John Dorsey is as different from Scott Pioli as you can imagine. Dorsey proved he is not afraid to admit a mistake by promptly cutting Robinson this offseason, whereas one could imagine Pioli’s stubbornness trying to force the coaching staff to fit him in somewhere. Pioli is still trying to prove his mettle by bringing back some of his mistakes to Atlanta! Count me as confident in Dorsey’s ability to move on, even when it means admitting a failure. You’re not going to bat 1.000 in bringing players in. The key is how you deal with those whiffs. The Draft this year will be more exciting than last year, where we knew with reasonable certainty that KC would draft one of the top 2 offensive linemen. This year, the field is open. Now is when we will see the collective wisdom of Dorsey and Reid and how they plan on building this team for the future. This thing is still wide open at this point in the lead-up to the draft. Pundits have been projecting every WR under the sun at this spot, from Odell Bekham, to Marqise Lee, to Kelvin Benjamin and Brandin Cooks. I don’t see it happening. Yes, this draft is deep at the WR position. But that list of guys are still a level below the top tier guys like Sammy Watkins and Mike Evans. Out of the group, if we had to take a WR here, I would say Cooks is the guy. But I’m not seeing it as the best move here. We will grab a solid WR later in the draft and have other pressing needs to address. The newest “en vogue” pick these days you will see is Stanford guard David Yankey. Sure, he’s a mauler and would plug in just fine, but why let proven guys go in the offseason for what would likely be similar cost? They could have tabbed Schwartz or Asamoah but KC chose not to. So why roll the dice in the draft now to replace them with an unproven guy in round 1 where traditionally you get poor value from the guard position. So where does that leave us? I’m thinking that the astute men in charge at One Arrowhead Drive can see the need for a strong secondary in this league, and especially this division. Our vaunted pass rush was completely neutralized when team started getting rid of the ball quickly, before our rush even stood a chance to get to the passer. So you can beef up the pass rush all you want, but as NFL trends show this pass year teams got rid of the ball quicker than ever, I’d rather make sure we are as tough in the secondary as possible. 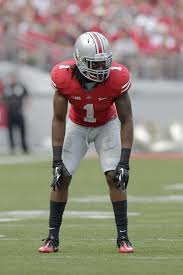 That’s why I’m projecting Bradley Roby, CB (Ohio State) as the Chiefs top pick this year. Sure, I’d prefer Justin Gilbert from Ok St, but it’s unlikely he’ll be here. Roby is a guy who has decent, but not tremendous size (5’11” 195 lbs) but plays big. He can fly, and he isn’t afraid to make tackles either. He has a nose for the ball (35 passes defended in 2 seasons) and if not for a minor off-field issue (suspended 1 game for a bar fight), he might be closer to the top of this position ranking. I would love pairing him with Sean Smith, with Flowers and Cooper, to form one of the deepest DB groupings in the NFL. 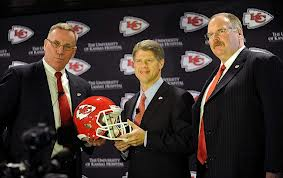 As a reminder, the Alex Smith trade resulted in the Chiefs giving up their 2014 2nd rounder. I would love for KC to trade back in Round 1, pick up an additional 2nd rounder, which gives us more flexibility in the 3rd round, but for this projection I’ll assume they couldn’t get the value they needed to trade down. Due to the depth of this year’s draft, the Chiefs can still get a solid player here. There are a number of them I would like, but am assuming won’t be around when they pick (Donte Moncreif, WR (Ole Miss), Ed Reynolds, S (Stanford)). 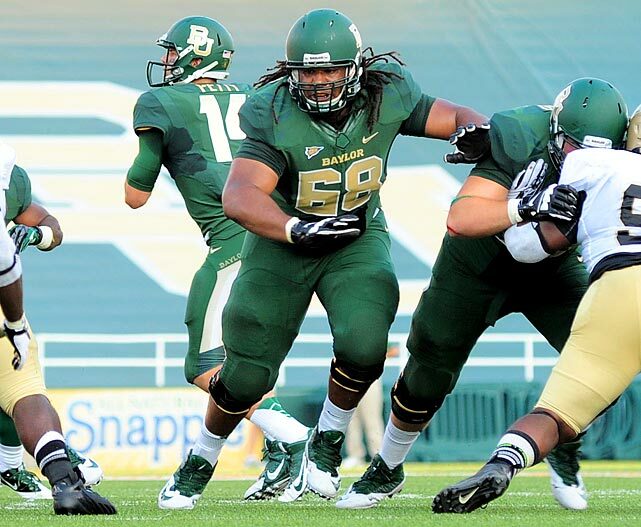 That is why I think the best available player for the Chiefs (which happens to be a position of need as well) is Cyril Richardson, OG/OT (Baylor). Richardson is a beast (6’5” 330 lbs) and very light on his feet for such a mammoth human being. He didn’t have the best Combine, but improved a bit during his workout. This may help him slip down this far to the end of the 3rd round for the Chiefs. While I don’t necessarily think losing Schwartz and Asamoah is a doomsday event for the Chiefs, you’d be fooling yourself if you don’t think it will have any impact on the offense. You lose a starter, plus a backup who was a former starter. I don’t care if Andy Reid is completely in love with Rishaw Johnson, the Chiefs need more depth and someone who can push him and newly acquired Jeff Likenbach. Richardson may just be the guy to do it. Plus, he adds OT depth where he played 2 seasons ago and that’s another spot sorely needed for KC (I’m not drinking the Kool-Aid tandem of Fisher and Stephenson). Many of you must be freaking out by now and wondering, where the hell is the wide receiver position? This is the deepest draft at the WR position in a long time and you still have yet to address it! Relax peeps, and remember it’s about value. KC needed to grab some value picks in the earlier rounds scooping up a solid CB and o-lineman. But it’s time to get some help at the WR position now that it’s starting to thin out at this point in the draft. 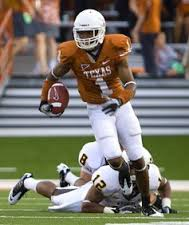 Kansas City jumps in and grabs Mike Davis, WR (Texas), a dynamic WR with impressive straight line speed and good route running abilities. He’s not a giant, at 6’ 195 lbs, but solidly built and not fragile. He has the production in college to back it up, having played all 4 years, and ranks 4th in UT history in catches and receiving yds. He should have the possibility of being the true #2 WR that KC has needed in the worst way by stretching the field and allowing Bowe to work slants and underneath where he excels. This may be wishful thinking, but remember that the inside linebacker position tends to get undervalued on draft day and as such you will see some surprises in terms of solid players falling. 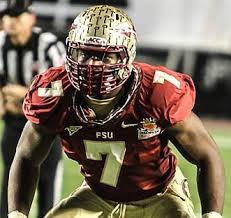 I don’t think it’s out of the realm of possibilities since most mocks have him going in the 4th – 5th rounds, so I’m sending Christian Jones, ILB (FSU) to our Kansas City Chiefs. This guy anchored one of the best defenses in college football last year, roaming the middle of the field for the National Champs. You may think KC is deep at the MLB position, but what we are missing a guy who can run (other than Derrick Johnson, of course) and cover. Jones will be like another good coverage safety out there on passing downs. He is still solid against the run, but his true value will be in his speed and coverage abilities on TEs and backs heading out into their routes. As for our current depth, we all know DJ is a world beater but he is also starting to get long in the tooth. I still think he is very much at the top of his game, but it’s only a matter of time until he starts slowing down. There’s not a single guy on the roster with the potential to fill DJ’s shoes. I’m not saying Jones is that guy yet, but he has more potential to step into that role than Joe Mays or Nico Johnson. Those guys are valuable as our thumpers and run stuffers, but we need the sideline to sideline guy who can cover too. I have to tell you, I think it would be Christmas in May if this guy falls to us at this point. It’s possible, based on his current projection as a 6th – 7th rounder, it’s not that far-fetched. Once again we can thank the “depth” at the position for why a guy like this might be around in the 6th. If I’m Kansas City brass, I’m doing cartwheels to the podium to get in the pick of Michael Campanaro, WR (Wake Forest). This guy is what you would get if you built the perfect slot WR in Madden’s player creator, if you were going to realistic about it. He’s a small, but solidly built 5’9” 195lbs. Oh yeah, and he can fly (4.46 40-yd dash). He catches everything thrown his way, and knows how to get open and work the D.
Well what about Weston Drexler? Throw this guy in against him in training camp for the slot competition, along with AJ Jenkins, and mark my words he will come out on top. I can see him being an every down player, something Dexter McCluter strived to be but ultimately never could become. McCluster is definitely a bit shiftier than Campanaro, but this kid knows how to play WR, and catch the ball. Two things Run DMC seemed to have trouble with yet still managed to carry around that tag of “promise”. Get Campanaro in here as a late draft pick and you’ll forget we ever had a hold at the slot position. We know at this point in the draft you’re looking to go with the best player available, so it’s quite a leap to project who is still here 6 rounds later. I do think KC has the potential to add some pass-rush depth with a guy who is probably considered a little bit of a tweener due to his size, but nonetheless is a legit player. 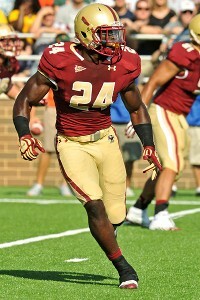 I have the Chiefs selecting Kevin Pierre-Louis, OLB (Boston College), an undersized Outside Linebacker that may serve as a situational player. He’s got the production as a 4-year starter at BC, having a great senior year (108 tackles, 10.5 tackles for loss, 6.0 sacks), and was even a starter as a freshman. He had a little trouble staying on the field due to injuries, likely due to being slightly undersized (6’1” 203 lbs), but he can still be someone to give some depth at the position behind Houston and Hali. He may at some point be able to leapfrog Frank Zombo when he gets some experience. At his point in the draft, I think KC would be thrilled if they wound up with a backup OLB with some potential to be a decent player. He’s also a high-character guy, for what that’s worth, and wouldn’t be someone the staff would have to ever worry about slacking or getting in trouble.